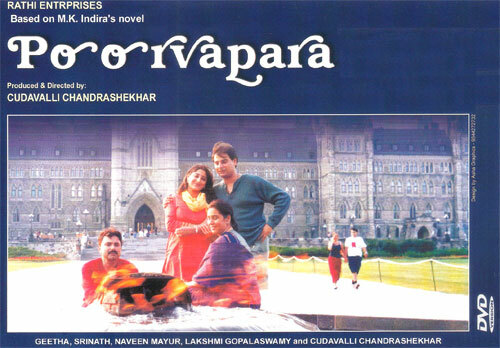 Poorvapara based on the novel of eminent writer M.K. Indira written during sixties which shows her vision, which looks like a real story today! Poorvapara is a must see film for A.B.C.D.s and people who have Dollar dreams! Trained in the abode of legendary Puttanna Kanagal, the producer, director and actor Chandrashekhar has done a marvelous job in selecting the subject and leading each character. Having firsthand experience of American lifestyle helped him making every frame look realistic. Unlike America America or Nanna Preethiya Hudugi, intention of this film was not to highlight USA's landmarks as a tourist guide but deals with Americas' social life and their busy lifestyle. Comeback of actress Geetha on big screen is a feast to watch - excellent performance by her. So is Naveen Mayur, a perfect fit for that role. Is debut for Lakshmi Gopalswamy - the heroine of the film. Srinath has small but very effective role. Cinematographer Bhaskar has done a good job on capturing the splendid beauty of Shringeri and amazing views of the US and Canada. Purvapara is a must see film for A.B.C.D.s and people who have Dollar dreams!